Let me tell you a secret. Even though I am trained in grief and loss therapy, and am even certified in this field, I still am at a loss when I work with grief therapy clients. After years of research, training, and actually doing grief therapy I have come to this conclusion. It is okay to feel at a loss when one does grief therapy. Why you may ask? Because, with grief therapy you can't make the "death go away". You can't fix things (In therapy the therapist can't fix things either). You have to understand that death is finite. Our grief and loss clients will grieve the rest of their lives. Grief and Loss Therapy can help with some, but not all of the pain. There is no magic wand in therapy to take the pain and grief away. But, there are some things that can be helpful to your grief therapy clients. 1. Never try to undermind a person's grief. Never compare or give examples of your grief. Each person grieves in a different way. 2. Yes, there are stages of grief. Of course, the grief therapist needs to know about these stages of grief. However, do not bring these up to a client at the beginning stages of grief. Wait until time has passed to bring out these stages of grief. Kübler-Ross later expanded the grief model to include all types of deaths such as personal loss, loss of a job, rejection, death of a relationship, divorce, moving, jail, drug addiction, and chronic illness. The grief therapist also needs to be able to access a "zone" when acting as a grief therapist. I go to this zone when I am working with a grief client, or tradgedy that I need to remain calm, centered, and professional, yet caring. It is a bit like a temporary wall. But I have to have this wall to make sure I hold it together during this time of grief. During this time it is not about me, it is about the grieving. While it is okay as a therapist to get a bit "misty eyed" during grief therapy one can't be the one crying and getting over emotional. This takes away from the ones who are grieving. If you are too close to the situation, you need to bow out and let another grief therapist take over. When I am finished with the therapy session, event, or funeral, I go home and allow my own feelings to process. Sometimes, I even cry at home. Sometimes, I go numb for a while. I allow this to happen. It is part of the process. I take really good care of myself during grief therapy sessions. Grief therapy will really take a lot out of you as a therapist. Make sure to eat well, meditate, exercise, and get enough sleep during these times. The death anxiety is real and it pulls all of us into the reality of death when someone dies. We realize we too will die one day. Therapist are no exception to the death anxiety rule! 1. First Thing: Just Listen. Just listening to the person who is grieving means so much to them. To listen is to show love and kindness. Make sure you use the deceased or dying person's name. Don't be afraid to use the name of the person as it means so much to the grief therapy client. 2. Touch: Of course be careful with touch, but a hug, a hand held, a pat can mean a lot to someone in grief. 3. I always say after listening a comment based on the relationship (The part I know about) of the grieving client and the deceased. Things such as, "I know you were such a great daughter to your mother because you were always visiting her at the nursing home". 4. When a death first happens, everyone is there for the ones who grieve. But wait a week or two, and they forget about the grief. People expect one to move on. But grief does not work like that. As a therapist, make sure you are especially there at this time for the grief client. Special occasions can stir up a lot of grief even when time goes by. Be aware of birthdays, events, holidays the grief therapy client might experience. I always mark the date of the death down and send a card or message to the grief therapy client a year later. I know they are thinking and grieving at this time. You can also get "some" help with healing from the eBook I wrote on grief therapy. 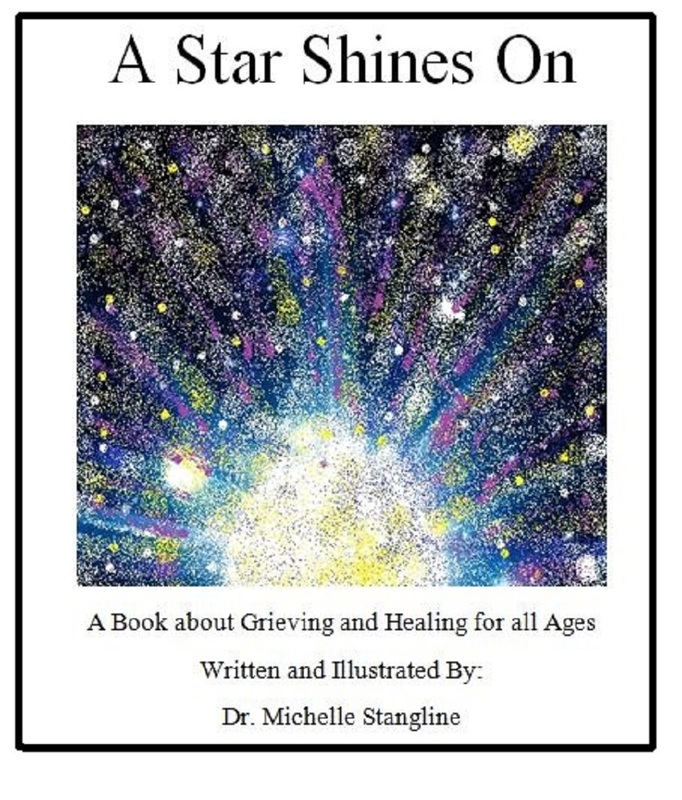 "A Star Shines On" is a beautiful book for all ages about grief and healing. Written by licensed professional counselor and grief and loss specialist, Dr. Michelle Stangline. This 21 page book is an excellent choice for children, teens, and adults who have experienced the loss of a loved one. The illustrations are beautifully created and the words soothe grieving hearts. The reader will also find helpful hints and suggestions for dealing with death and how to help someone who is grieving. There is also a special page for children to create a "Star Light Jar" in memory of a loved one. This book is a treasure for years to come. It is appropriate for all religions, races, cultures, and ages. 5. It is so sad to "accept" that every living thing will eventually die. One thing that helps me is to know that along with all the good things in life death robs a person of, the bad things in life will never happen again to the deceased person. I tell my grief therapy clients that the lost loved one will never be sad, hungry, cold, or in pain again. This brings some peace to the grieving therapy clients. 6. Never underestimate the grief of a pet. To many people, their pets are like family. 7. Don't ask, just do it rule. When people grieve they need to have people look out for them. In the south, we bring food. Don't ask if you can bring something, just bring it. Bring a bag of groceries, a take out, or cook something. Leave it at the door if you need to. 8. Some people grieve in private and do not want to talk about this. Please respect this! It does not mean they are not grieving. It means they do it in a different way, and thats okay. After years of doing grief therapy I find that grief never looks the same twice. Be prepared for anything! When your grief therapy clients are ready (And they will let you know) try some of the grief therapy activities on the links below. Help your clients deal with grief & loss.